Video game developer Turtle Rock Studios has generously packed this 192-page hardcover with lots of wonderful concept art from the game. Now this is the type of treatment I wish had been used for the underwhelming The Art of Avatar, companion book for James Cameron's movie. The book's filled with beautifully painted sci-fi landscapes that seem truly inhabitable. Of course for the most part monsters are out there but the place feel alive. You'll see the cliche use of huge moons in the background but the overall mood is captured very well. The jungles feel humid and there's the atmospheric perspective that make further places obscure, dangerous because you don't know what's lurking out there. It reminds me of Avatar's landscape except without the floating islands. There are more variety here with different landscapes. Many concept artworks of creatures are included, drawn in detailed pencil sketches, colour painted or rendered in 3D. The creatures look as if they could be from the wildlife of Star Wars. There are also some dangerous looking plants. There's a double page drawing of some humans standing by the river bank with huge dinosaur-size crabs feeding in the background which made me felt like I was watching Jurassic Park for the first time. The pages of character designs has lots of huge beautiful drawings. They all come with a profile that talks about their abilities, primary and secondary weapons and other equipment. And then there are the weapon designs. The chapter on LocoTech comes with concepts of industrialised areas just outside the jungles. There are spaceships, machinery, factories and piping network that reminds me of oil refineries. As usual, everything is painted in nice detail and lighting. While the developer wanted to create their own distinct look for the game, at times the environment does reminds me of Avatar and the Star Wars universe. Not that it's bad, it's actually good because the art is great. And there's this element of discovery and surprise that I get when looking at the environment and creature concepts. 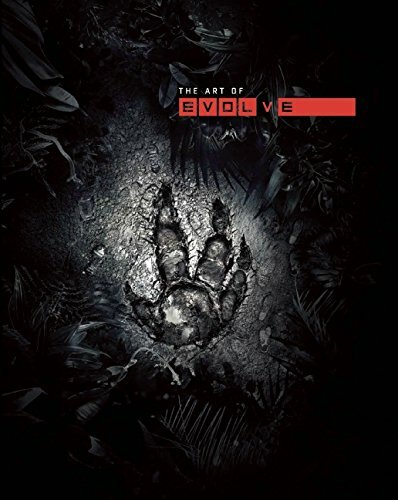 The Art of Evolve is a wonderful video game artbook. Highly recommended to fans of the game and those who like sci-fi, creature and environment art. Note that there are two publishers for this book, namely Insight Editions and Titan Books. Links to the books are at the bottom.